For those with a taste for the burlesque, politicians speaking for the cash interests of the perishable food trade are hard to match. The smaller the politician’s country of origin, the louder the petomane, and the bigger the pratfall. Russia has demanded full epidemiological and laboratory disclosure from Germany and the EU, after the German press falsely blamed the source of the outbreak on Spanish cucumbers, and then protected the likely German source, a bean-sprout farm in Lower Saxony. There is suspicion in Moscow that misleading press statements from German laboratories and food safety officials were intended to pressure Russia into ending its embargo. As a result, Onishchenko’s agency, Rospotrebnadzor (RPN), has signed a requirement with the European Commission imposing new certification rules for EU testing laboratories and for vegetable imports; for the time being only shipments from the Netherlands, Poland and Belgium qualify. If new infections are reported in the EU within ten days, the ban will be reimposed. John Dalli, a Maltese and the EU commissioner for health – one of the negotiators in Moscow this week – has conceded that partial and misleading disclosure by the Germans had been problematic. “It is crucial that national authorities do not rush to give information on the source of infection that is not proven by bacteriological analysis, as this spreads unjustified fears (among) the population all over Europe and creates problems for our food producers,” Dalli said. On Monday, the Kremlin was angered by a remark of EU trade commissioner Karel de Gucht, who suggested that Russia’s import ban was “completely unacceptable”, and threatened the EU’s ongoing negotiations with Russia on accession to the World Trade Organization (WTO). His was not the first EU statement attacking the Russian embargo as out of line with the bilateral trade rules. European officials were also upset that the Russian negotiating line appeared to distinguish between Berlin, Madrid, and Brussels; and between individual member governments of the EU instead of accepting safety compliance undertakings from the EU as a bloc. De Gucht, a Dutch-speaking Belgian politician with farm origins and a history of public gaffes (right image), was the most explicit of the EU official attackers, though he himself was not engaged in the food product certification negotiations. His comment, made in Washington, was repudiated by Russia’s Ambassador to the EU, Vladimir Chizhov. Chizhov had said earlier: “The problem is not with the Russian ban. The problem is with the — well, I wouldn’t like to say the EU coli — but the disease that has struck a dozen countries of the European Union.” He said the total ban had been imposed because the Russian authorities received no official information on the problem or its source. 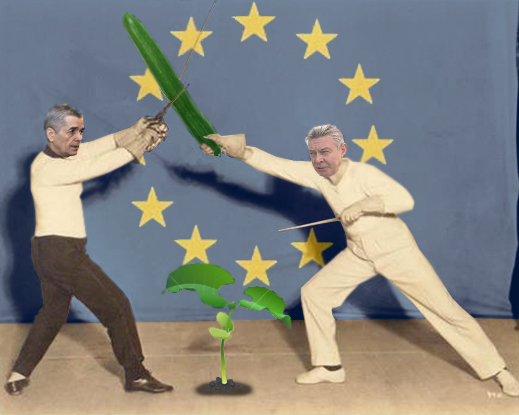 Onishchenko has told reporters in Moscow that EU officials had been too quick to claim the June 10 summit meeting of Russian and European presidents in Nizhny Novgorod had agreed on immediate and unconditional resumption of the vegetable trade.The last word appears to be Onishchenko’s, because he must now determine whether laboratory certifications submitted for imports will be acceptable. The extra condition – that if anyone in Europe gets an e.coli infection of the type exhibited in Germany, the Russian border will close – is an unprecedented concession by Brussels to Moscow. Independently of Onishchenko, the Russian veterinary safety agency, Rosselkhoznadzor (RSN), issued on June 22 a ban on imports of dairy, poultry and other animal products from three German dairy companies and ten German meat companies, starting next Monday. The RSN notice refers to “systemic weaknesses of a number of enterprises in Germany”, identified in inspections carried out in April. RSN also says the ban was implemented in conjunction with the German inspection authorities. Last year’s EU exports of vegetables to Russia were valued at almost $870 million. But they were not expected to go higher this year, because domestic production was already up, before the ban. Valentin Denisov, the chairman of the State Duma Agrarian Committee, was quoted by the Tass news agency on June 10 as saying the ban on imports would not lift domestic prices; that’s a sensitive issue as the Russian parliamentary election campaign gets under way. “EU vegetable imports neared $480 million in 2009 and topped $720 million in 2010. There was a poor vegetable harvest [in Russia] last year so we had to increase the imports, including those from EU member countries. This year the situation is favorable, so the halved imports will bring us back to the year 2009, in which we had no [vegetable] deficit,” he said. So it’s hats off to Onishchenko! 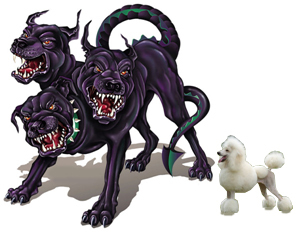 fiercer than Cerberus at the Russian food frontier – poodle for domestic food safety.